In this hectic, busy world, sometimes as women we don’t get a chance to prioritize ourselves. With topics like mental health and self-care on the tip of everyone’s tongue lately, it’s time for women to put themselves first and take a breather from the everyday craziness! Rustic Mama Retreats Ultimate Girls Getaway is the perfect place for you to relax, refresh and reconnect with yourself and other fabulous like-minded women. You’ll have the chance to engage in a variety of amazing sessions such as yoga, sign making workshops, paddle-boarding, archery, tree-top trekking, dance parties and the opportunity to partake in workshops taught by talented guest speakers, all designed to be fun, exciting and allow you to relax and rediscover yourself. Secure your spot with only a $100 deposit! There is something for everyone at our Ultimate Girls Getaway. The biggest problem you’ll have is choosing which session to sign up for! Fun, adventure, education, friendship and relaxation await you at our lakeside escape! Maybe you’ll spend the morning creating a masterpiece! 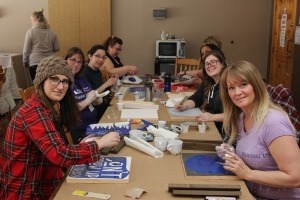 Take a guided painting workshop, or try your hand at making a rustic wooden sign or authentic dream-catcher. Reflection more your thing? Breathe and relax during a sunrise yoga session or enjoy the peacefulness of the lake with a morning paddle. Then maybe step into a vision board or guided journaling workshop. Why not ramp it up in the afternoon and set your thrill metre to high! Cheer each other on as you tackle a state of the art high-ropes course or touch the sky by scaling and rappelling the 30′ tall rock climbing wall! Take your aim in the archery field or use those critical thinking skills to break out of the escape room. The fun doesn’t stop there! Evenings at Rustic Mama Retreats are filled with entertainment! From Friday night wine socials, to Saturday night dance parties we’ve got the perfect recipe for an exciting evening! Don’t worry if you want a quieter escape! There are several opportunities throughout the day to relax and reflect and each night is capped off with a cozy outdoor campfire on the waterfront. It’s the perfect place to unwind and chat with friends old and new. At Rustic Mama Retreats we strive to be affordable and accessible to women everywhere. We don’t want anyone to miss out on the fun! While some retreats the offer programming of this kind for $800-$1200, we’ve worked hard to offer great value for a much lower cost! 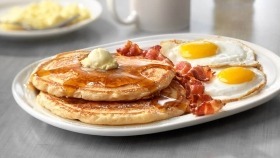 * 6 delicious chef-prepared meals and a variety of snacks throughout the day. You definitely won’t go hungry! * a gift to commemorate your fabulous weekend and much more! All registered participants will be invoiced by Murdoch Travel – TICO #50023330 in accordance with the Ontario Travel Industry Act. 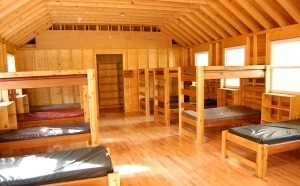 Camp Kintail is located near Goderich Ontario and is right on the shores of Lake Huron. 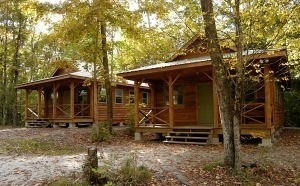 Beautiful cabins, yurts and program buildings are scattered across the vast property and there is no shortage of activities available. High Ropes, Zip Lining, Climbing Wall, Kayaking and Outdoor Fitness are just the beginning. With an outdoor theatre steps from the beach, you will find many spots to sit, relax and reconnect with yourself and nature at this beautiful location. Accommodations at all these Retreats include cozy, winterized, lakeside cabins with electricity, perfect for bunking down with girlfriends. All have access to full washrooms buildings with sink, showers and toilets. Most cabins accommodate 6-18 people so be sure to let us know if you have any cabin mate requests or come with a large group of friends and have a cabin all to yourselves! Remember to bring your own pillow and sleeping bag, and a flashlight to navigate to your cabin at night. All of our locations have their very own chefs that will provide amazing, nutritious and delicious meals throughout the weekend with both healthy and indulgent options! Meals will include incredible homemade baked goods, vegetarian options and a delicious salad bar. Please be sure to inform us of any food allergies/intolerances or health issues you feel we should be aware of well before arriving at camp. Our incredible chef and his staff can satisfy all special dietary needs, as long as we know in advance. Some wine will be available during the evenings but feel free to bring your own beverages for consumption in your cabin. Sounds Amazing Right?! - Sign Up Here! We always expect the unexpected in cottage country, but typical weather in Spring can include hot days, cool nights and the odd rain shower. Be sure to bring a warm jacket for night-time campfires and star-gazing, as well as a raincoat and rubber boots in case the weather gets the better of us! A full packing list will be emailed to you a few weeks prior to the event. amp Kintail is located near Goderich, Ontario which is roughly 2.5 hours NW of Toronto or 1.5 hrs North of London right along the shores of Lake Huron. 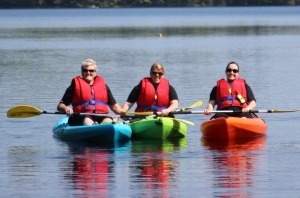 Bark Lake Leadership and Conference Centre is located in Irondale, Ontario, only 1 hour North of Peterborough, or approximately 2.5 hours NE of Toronto. 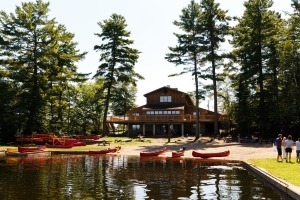 Camp White Pine is located in Haliburton, Ontario, also 2.5 hrs NE of Toronto. Surrounded by gorgeous lakes and amazing views, the drive there is nothing short of beautiful.